The United Nations Framework Convention on Climate Change reached agreement in Bali on Saturday on a roadmap to reach a new international climate change agreement. Several Google.org team members attended and have shared their thoughts on some of the themes of the conference: putting the Bali roadmap in context, climate change and economic development, local government actions, and an introduction to the negotiations. We hope you find these writeups informative. Just how large that “burden of adjustment” will be is uncertain, but the UN Human Development Report released in anticipation of UN Conference proclaims that “climate change is the defining human development challenge of the 21st Century” and that “failure to respond to that challenge will stall and then reverse international efforts to reduce poverty.” The idea of climate justice comes into play when considering who will pay for climate adaptation when those countries that have done the least to cause global warming bear the greatest cost. Different groups here in Bali have even attempted to put a dollar amount to the cost of adaptation. Oxfam, for example, estimates the cost to be $50 billion per year and far more if emissions are not cut rapidly. For many NGOs in Bali, climate change offers an opportunity to engage a new community of stakeholders and introduce ideas of environmental equity into the debate. Victoria Tauli-Corpuz, the Chairperson of the UN Permanent Forum on Indigenous Issues, described the phenomenon as a “moment to challenge traditional development paradigms.” Local organizations such as the Indonesian Civil Society Forum for Climate Justice have sprung up in the past year to address the climate challenge while more established NGOs such as UNICEF have begun to incorporate work on climate justice and adaptation into their work. Even though several side events and exhibit booths here in Bali focus on climate justice and adaptation, they are still a relatively small percentage of the overall NGO representation at the conference. Michael Dorsey from Dartmouth College and the Durban Group for Climate Justice points out that the International Emissions Trading Association (IETA) still dominates in Bali with 336 representatives making up 8% of all NGOs listed. That is equal to more than the delegation of Greenpeace (~2%), the World Wildlife Fund (~1.6%) and Friends of the Earth (~1.5%) combined. One silver lining that is gaining momentum here in Bali is the idea of "green jobs" created in the new energy economy. Most admit that further research on this topic is necessary to determine which sectors of society will benefit most from these jobs, but the concept resonates with many climate justice advocates in search for solutions. The theme today in Bali perhaps could best be summarized by the bumper sticker maxim, "think globally, act locally." While the delegates continued negotiations on an international climate change agreement, several events highlighted efforts by local communities around the world to confront the climate crisis and secure their own clean energy future. Local cities from Milano, Italy to Betim, Brazil to Bhubaneswar, India shared their experiences deploying renewable energy projects in their cities. In partnership with ICLEI, they have banded together with other cities around the world (ICLEI map below of participating cities below) to share expertise and best practices on renewable energy and energy efficiency. The U.S. Climate Acton Network highlighted efforts by U.S. states (including 9 of the country's 10 largest emitting states) to reduce emissions, along with the pledge by over 700 U.S. mayors to meet the Kyoto Protocol targets in their cities and towns. Other innovative programs mentioned included the City of Berkeley's solar home financing plan; Chapel Hill, North Carolina's free public transit; and the City of Austin's plan to power all city facilities with 100% renewable power. The Climate Group released a report on state and regional Low Carbon Leaders showing that emissions reduction targets set by local governments are often more ambitious than commitments pledged by national governments under the Kyoto Protocol. ICLEI convened a series of local government climate sessions as parallel events to the Bali meetings. The flurry of local activity represents some frustration with the pace of international action, according to German Minister for Economic Cooperation and Development Heidemarie Wieczorek-Zeul. "We can't wait for every detail to be correct at the international level; we have to act now and we can act now if we act locally." Monika Zimmermann of ICLEI hopes the 'can-do' attitude of state and local governments will be contagious. "We're not just doing the right thing for our own sake, we want to prompt national governments and the international community to follow our lead." 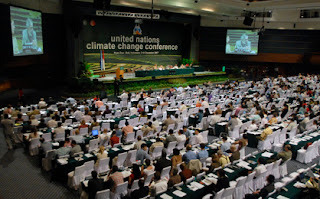 This week, representatives from 190 countries are gathering in Bali, Indonesia to begin framing an international climate change agreement to succeed the Kyoto Protocol, which expires in 2012. The delegates are joined by thousands more -- activists, local politicians, NGOs, businesses and others -- responding to the call for action. The good news is that the IPCC has identified a wide a range of solutions for curbing greenhouse gas emissions that are both technologically feasible and economically competitive. 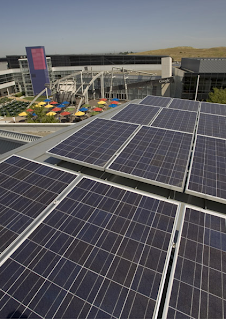 Here at Google we are working to accelerate some of these technologies through our our recently announced Renewable Energy Cheaper than Coal initiative, Google.org's RechargeIT program, and our 1.6 MW solar installation. But our own efforts can only get us so far. That's why we are participating in the Bali conference. The world must chart the path to a clean energy future collectively. Over the coming days, we'll share our reflections and the stories of those who are there. You can also check out the live webcast of the conference. Last week an Associated Press story highlighted the fact that climate change is contributing to the rise of infectious diseases. According to the article, several hundred cases of chikungunya fever -- a virus that in past has only been common in Africa and Asia -- have been reported recently in Italy. Rising temperatures are creating new breeding grounds for diseases to emerge, and the expanded movement of people and goods are increasing disease spread worldwide. This European outbreak is one of a series of recent warning signs of the mounting risks that our changing climate poses to human health. While everyone in the world face risks from emerging infectious diseases and other threats associated with global warming, the poorest people are most vulnerable. The good news is that momentum is growing worldwide to address climate change by reducing emissions of greenhouse gases. The bad news is that even with aggressive global action to reduce emissions, the climate will continue to change for decades as a result of previous emissions. Scientific research suggests that if actions could be taken to immediately stop the rise in atmospheric greenhouse gas concentrations, the inertia of the climate system is such that 0.5°C (0.9°F) or more of additional global average warming would still occur. 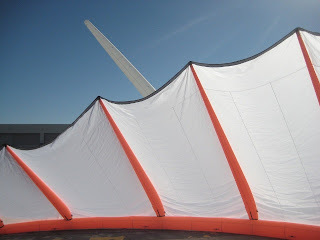 One thing is certain: the future will hold more changes and more surprises, and we need to be prepared. Those of us on the Google.org team are working at the intersection of climate change, global public health, and poverty to help reduce the vulnerability of the world's poor to the emerging diseases of the future. a major R&D effort and set a lofty goal of generating a gigawatt of renewable electricity at a cost below electricity from coal-fired power plants. Google.org will be a partner in this ambitious endeavor by providing funding for companies and projects with promising, scalable and potentially breakthrough energy technologies. Two of the early-stage companies we've begun to work with to drive down the costs of renewable energy are eSolar Inc. and Makani Power. We're looking for more strategic investments, so please write to us at renewables@google.com if you're working on this problem too. 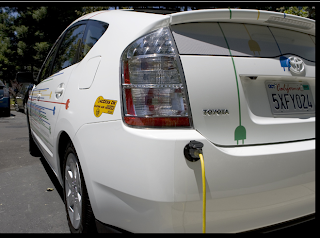 You may recall that last summer we announced an RFP (request for investment proposals) as part of our RechargeIT aiming to accelerate the adoption of plug-in hybrid electric vehicles and vehicle-to-grid technology. After reviewing more than 350 applications, last week we selected just under 40 companies in categories including batteries, components and vehicle-to-grid solution to advance to the next round of review. Look for us to announce investments in some of these interesting companies during the first quarter of 2008. Makani kite photo courtesy Makani Power. Today Google launched a major R&D effort and set a lofty goal of generating a gigawatt of renewable electricity at a cost below electricity from coal-fired power plants. Google.org will be a partner in this ambitious endeavor by providing funding for companies and projects with promising, scalable and potentially breakthrough energy technologies. Two of the early-stage companies we've begun to work with to drive down the costs of renewable energy are eSolar Inc. and Makani Power. We're looking for more strategic investments, so please write to us at renewables@google.com if you're working on this problem too. Around Google we know firsthand the value that small changes, aggregated on a large scale, can bring to people everywhere. It's how our search engine and advertising system work: every click counts. Similar thinking — local action, global impact — is what made Cyan Ta'eed, her husband Collis Ta'eed, and Leo Babauta create Blog Action Day, a worldwide initiative to get blogs posting about a common cause: the environment. As Cyan has said of bloggers and readers around the world, "If they all make a very small change it could be very effective, and a small step but an important step" on the road to addressing climate change and other environmental challenges. In this first year, more than 10,000 bloggers are participating in Blog Action Day around the world. We're pleased to be among them. Fifteen of our corporate blogs are posting today, on topics varying from this weekend's International Clean-up Day to this year's Nobel Peace Prize recipients. Other blogs covered a competition for the best sustainable designs using SketchUp, green programs on YouTube and the efforts of the Bioneers to bring together thinkers from many disciplines to tackle environmental issues. We also enjoy various company-wide green initiatives, from offering employees shared hybrid cars on-site to serving organic food to installing solar panels. We look forward to seeing the momentum of Blog Action Day, and we encourage you to join the many bloggers and citizens who are making their voices heard about environmental concerns. Update: Check out posts on more participating Google Blogs: Blogger Buzz, Blogger Buzz - ES, Checkout Blog, Finance Blog, Google Base Blog - DE, Inside AdSense, Inside AdWords, Inside Google Book Search Blog, the Google Italy Blog and Blogs of Note - EN and ES. Last week the Nobel Foundation awarded Al Gore and the United Nations Intergovernmental Panel on Climate Change (IPCC) the Nobel Peace Prize. Former U. S. Vice President Al Gore was honored for his work on climate change and his Oscar winning documentary An Inconvenient Truth. The IPCC, a joint project of the United Nations Environment Program and the World Meteorological Organization, was honored for its efforts over the past two decades to educate the world about climate change. Earlier this year, the IPCC issued its strongest statement to date, finding the evidence of climate change "unequivocal" and concluding with 90% certainty that humans are the cause. "Indications of changes in the earth's future climate must be treated with the utmost seriousness, and with the precautionary principle uppermost in our minds. Extensive climate changes may alter and threaten the living conditions of much of mankind. They may induce large-scale migration and lead to greater competition for the earth's resources. Such changes will place particularly heavy burdens on the world's most vulnerable countries. There may be increased danger of violent conflicts and wars, within and between states...the Norwegian Nobel Committee is seeking to contribute to a sharper focus on the processes and decisions that appear to be necessary to protect the world’s future climate, and thereby to reduce the threat to the security of mankind. 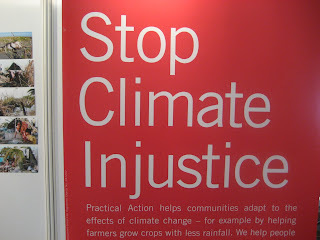 Action is necessary now, before climate change moves beyond man’s control." Al Gore has argued for rising to meet the challenge of climate change from a moral perspective: "The climate crisis offers us the chance to experience what few generations in history have had the privilege of experiencing: a generational mission; a compelling moral purpose; a shared cause; and the thrill of being forced by circumstances to put aside the pettiness and conflict of politics and to embrace a genuine moral and spiritual challenge." We agree wholeheartedly, and congratulate Al Gore and the IPCC on this historic recognition! Reducing climate change by saving energy is an important effort we should all join, and that's why we're very glad to see the innovative thinking going into a variety of solutions. One idea, suggested by the site called "Blackle" (which is not related to Google, by the way, though the site does use our custom search engine), is to reduce energy used by monitors by providing search with a black background. We applaud the spirit of the idea, but our own analysis as well as that of others shows that making the Google homepage black will not reduce energy consumption. To the contrary, on flat-panel monitors (already estimated to be 75% of the market), displaying black may actually increase energy usage. Detailed results from a new study confirm this. As computers become a bigger part of more people's lives, they will consume an increasing amount of energy, which is why we've invested so much in making our data centers efficient and we've joined with others to launch Climate Savers Computing, which has a goal of reducing total power consumption by more than 50% for all computers by 2010.
turn on the power management features. Virtually all computers today have the ability to switch into low-power modes automatically when they're idle; very few computers have this capability enabled! Here's how to do it on computers running Windows XP. to find the most efficient PCs available today, look for the words "EnergyStar 4.0 compliant." Climate change continues to be one of the biggest, most challenging problems our planet faces, and we know that a sustained global effort is needed if we're going to have any hope of reversing its effects. In that spirit, today we're announcing that Google will become carbon neutral by the end of 2007. This is an important step in our long-term pursuit of holistic environmental solutions. - purchase carbon offsets for the emissions that we can't reduce directly. To calculate our carbon footprint, we took into account emissions from purchased electricity, employee commuting, business travel, construction, and server manufacturing. In a partnership with the Environmental Resources Trust (ERT), we have independently verified this assessment, and will do so every year. In order to meet our short-term goal of carbon neutrality, we have decided to purchase some carbon offsets. To be clear, we see carbon offsets not as a permanent solution but rather as a temporary tool which allows us to take full responsibility for our impact right away. By investing in projects elsewhere in the world that cut the overall amount of greenhouse gases, we can help reduce climate impact now while we develop more sustainable strategies for the future. When considering an offset project, we carefully examine the project's environmental integrity, its ability to be monitored and verified, and the impact that our investment will have in furthering that project's goals. In other words, we want to make sure that our offset funding directly enables the project, and that the carbon savings of the project are real. As you may have read, Google already has several other environmental programs and initiatives in place. Last week we announced the Climate Savers Computing initiative to greatly improve computing energy-efficiency standards. (Make sure your next computer purchase is a compliant PC!) Transportation is another major area of focus. Our employee shuttle system provides a commute for more than 1,500 Googlers daily around the San Francisco Bay area, and several hundred more have also taken advantage of our rebate when they bought a fuel-efficient vehicle. We're equally committed to finding and developing new green technologies and sources of energy. We just completed our solar panel installation in Mountain View, the single-largest corporate solar installation in the U.S. to date. We've also joined the World Resources Institute's Green Power Market Development Group, so we can work with other companies to make more green power available to everyone. 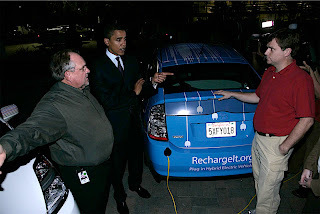 And of course Google.org is working on creative new initiatives, including plug-in hybrid cars. In addition, we've set ourselves the ambitious goal of creating 50 megawatts of new renewable generation capacity--enough to power 50,000 typical U.S. homes--by 2012. Still, we're only one company, so aside from improving our own practices, we want to do more to raise awareness and commitment worldwide. We feel we can best do this through our products and services, which reach millions of people every day. For example, Google Transit makes it easier than ever to find and use public transportation around the globe. New custom tabs on iGoogle bring climate news, energy-related talks on video from our @Google series and other environment-related content to your homepage. Google Maps users have created mashups to show possible coastal flooding if the sea level changes, or to map climate data for cities worldwide. And we're urging lawmakers to create clear public policies on important issues like energy-efficiency standards, increased funding for public research and development of energy technologies, and regulation of greenhouse gas emissions. To learn more, visit our new site on energy initiatives, which details much of this work to date.